Are you an avid cook? Do you dream of having a beautiful kitchen with all the professional features of your favorite 5-star restaurant kitchen? One device that will certainly make it easier to cook in your home kitchen is a pot filler faucet. 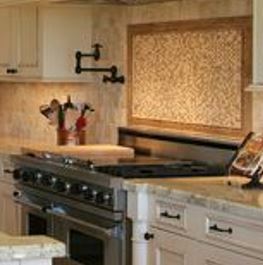 A pot filler faucet is a separate faucet that’s mounted on the wall over your stove. This type of faucet comes with a long, jointed arm that can swing out over your range, so you can fill pots and pans with water while they sit on your stovetop. When the pot filler faucet isn’t in use, it can be pushed conveniently out of the way, back toward the wall. You Won’t Strain Yourself Carrying Heavy, Water-filled Pots. Did you know water can weight a little over 8 pounds per gallon? Depending on the size of your kitchen pots, you could be lugging as much as 20 pounds or more from your sink to your stove. When you carry a large pot of water, you put a lot of stress and strain on the muscles and bones in your hands, wrists, arms, and back. With a pot filler faucet, you don’t have to carry heavy, water-filled pots across your kitchen. So, you don’t need to worry about a potential injury. Also, a pot filler faucet is a safer option for older individuals who don’t have the strength to the carry a heavy pot. You Reduce Your Chance of Water Spills. When you carry a heavy, water-filled pot from your sink to your stove, you may end up slopping water all over the place. Not only does this cause a mess in your kitchen, but you could slip on the wet floor and really hurt yourself. When you fill your pans with a faucet directly over your stove, you don’t have to carry those water-laden pots. Your kitchen will stay cleaner, and you’ll stay safe. You Can Easily Fill Your Pots and Other Containers with Water. If you have a small kitchen sink and faucet, you know it can be a struggle to fit larger pots and containers under the faucet to fill them. With a pot filler faucet, you can effortlessly fill that large pan of potatoes with water to prepare your holiday meal. And, you can stop trying to figure out how to maneuver your large vase under the spout to fill it with water after your loved one brings home flowers. Also, your watering can will fit with no difficulty under your pot filler faucet, so you can water your parched houseplants. You’ll Be Able to Multitask While Cooking. Since you’ll be able to fill your pots right at your range, your sink will be free to clean vegetables, rinse pasta, fill another pan with water, or wash dishes at the same time. You’ll save time and be able to work more quickly and efficiently. If you want a pot filler faucet for your kitchen, contact the professionals at Pipe Dream Plumbing. Our plumbers will determine the correct placement for your pot filler faucet. We want to make sure your pots will fit easily underneath your new faucet. But, we also want to make sure the faucet isn’t too high that you can’t reach it. And, we’ll make sure there’s enough room over your range that the faucet can be pushed back, so it doesn’t get in your way. Once the correct placement is determined, we will install a water supply line inside the wall behind your stove and mount your pot filler faucet. In no time at all, you’ll be able to whip up some gourmet meals with greater ease and convenience. Make it easier to cook at home. Call Pipe Dream Plumbing today at 317-388-1988.